Nearly 500 runners from 20 clubs raced around Fairlands Valley Park on Sunday. In their home fixture the whole men’s “A” team were in the top 90 and four in the top twenty. After three laps and about five miles, or eight kilometres, CALLUM STEWART was the fastest Spartan fifth overall in 27 minutes 50 seconds. The other top thirty Spartans were DAN McALPINE, 10th in 28:21; CHRIS WESTCOTT, 12th in 28:25; SIMON JACKSON, 13th in 28:25 and JONATHAN PARR, 27th in 29:10. PAUL HEWETT was under thirty minutes with 29 minutes 58 minutes and 43rd. SUZY HAWKINS was fastest female from Fairlands. She was tenth out of the 168 women and 130th overall in 33 minutes 33 seconds. RHIANNON GRIFFIN’s comeback continues. Only two weeks after her first race in several years she moved up 37 places and jumped in the women’s “A” team at 297th in 39 minutes 45 seconds. She was buzzing afterwards and her enthusiasm infectious. YUKO GORDON, 203rd in 36:26; ISABEL GREEN, 220th in 37:21 and KERSTIN WEINER, 326th in 40:35 completed the “A” team. A few seconds later KAREN ELLIS lead in the “B” team with 40 minutes 43 seconds. Increased participation helped the Spartan men to fourth out of twenty clubs in Sunday’s race, only eight points behind third placed Watford and they moved up to fifth overall in the league after three fixtures. The women’s “A” team were sixth. The club and the whole league owe Fairlands Valley Spartans Chair SOPHIE COWAN a huge vote of thanks for making the race happen. There were 483 finishers compared with 445 at Trent Park on 2nd December. 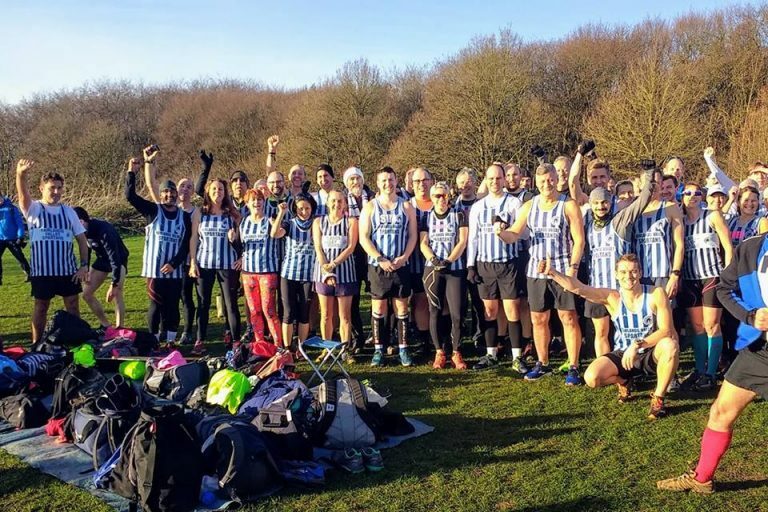 The next cross country league race will be in Watford on Sunday 13th January. The Spartans will also be represented at the County Cross Country Championships in St. Albans on 6th January. All 65 Spartan results can be found near the end of this release. MEGAN TAYLOR ran the Waterside 10K road race in 54 minutes 22 seconds. The cold windy weather didn’t put Spartans off from their weekly dose of Parkrun action. Jonathan Parr was second at Stevenage in 17:55. Sean MILLWOOD ran a new PB of 28:55 at Stevenage on his fourth Parkrun. Nick Witcombe ran his 21st Parkrun at Pocket in St Neots in 32:08. There were 483 finishers compared with 445 at Trent Park on 2nd December. Team results should be announced by the league organisers in the next few days. A total of 344 runners took part.